December 11, 2017 December 10, 2017 / Elizabeth T.
Ruffles may have been a huge spring and summer trend, but there’s no reason we can’t transition this feminine embellishment in to the winter, right? There’s just something about the dramatic flutter of ruffles that makes it a perfect detail to instantly elevate an ensemble for a feminine vibe, especially when it’s a simple blouse or sweater. I’ve been loving this soft knit so much because it’s so comfortable and cozy, but the ruffles give it just a hint of flirty fun, don’t you think? 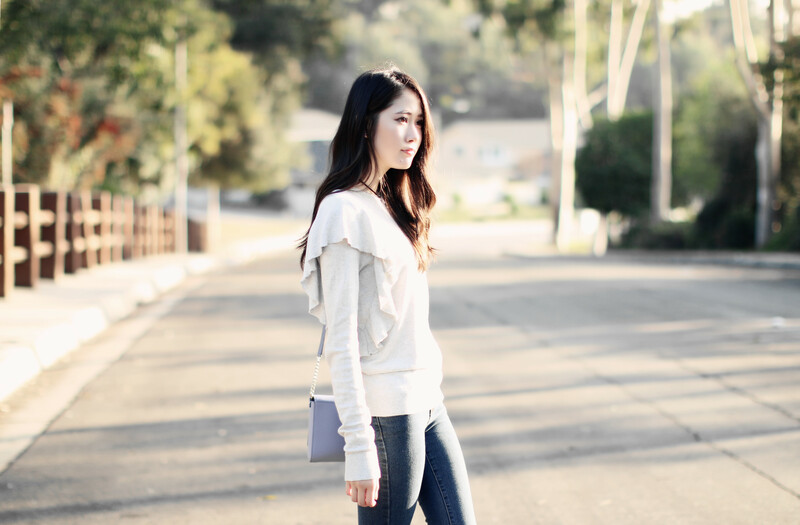 Because ruffles are already dramatic on its own, I opted for a neutral color like light heather grey, and a simple silhouette, pairing it with a pair of fitted skinny jeans. To pull the whole look together, I also threw on my trusty plaid longline coat and favorite sneakers, making this a very chic and effortless off-duty look! Are you a fan of ruffles? How will you style ruffles in the winter? Let me know in the comments because I always love hearing from you! Love ruffle so much! pretty look ! Such a great look! Love your ruffle top and the winter coat! I love wearing ruffles during the cooler months actually. It definitely makes an outfit look more fancy and perfect for the holidays. Yes, I can’t agree more! ❤ 🙂 There's just something about the fluttery fabric that makes it so chic and feminine! That coat is sooo good! That plaid coat is so pretty- it matches so well too! I’d love to have one like that. The ruffle top is also so cute, I haven’t shopped in so long and I’m hoping to do a tiny bit of shopping for the winter so thank you for the inspiration! Love the coat, you look so gorgeous babe! Yesss, I’ve been obsessed with longline coats so much ❤ 🙂 Thank you so much for stopping by love! It means a lot to me! Great look! The coat is amazing! That coat is so cute. I love how you styled it. I like how you styled it. So chic and cute. I’m usually not a fan of ruffles like these but I really like your outfit! Aww thank you so much Olga ❤ 🙂 Glad you liked the ruffled sweater!